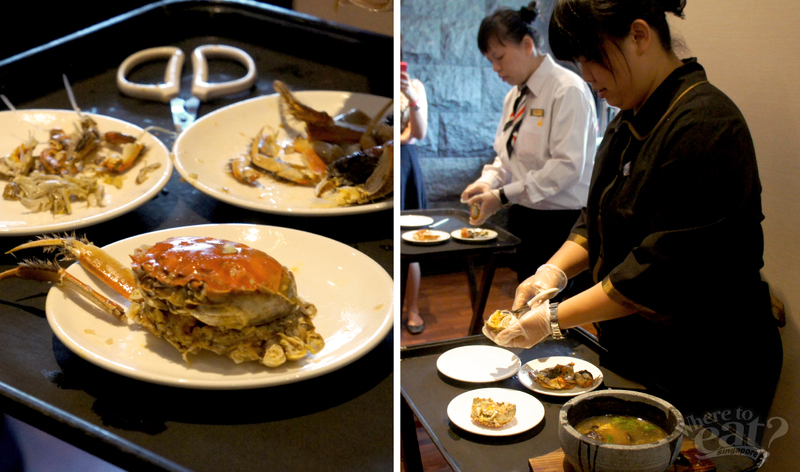 We were invited to Peony Jade’s Hairy Crab Tasting session, “The Gold Rush’. Needless to say, we were very excited because hairy crabs are seasonal and are known for their delicious golden roe. A freshwater crab, the hairy crab can be found in Yangcheng Lake, in the Jiangsu province, China. They mature in the months of September to December, so do grab the chance to taste them when you can. 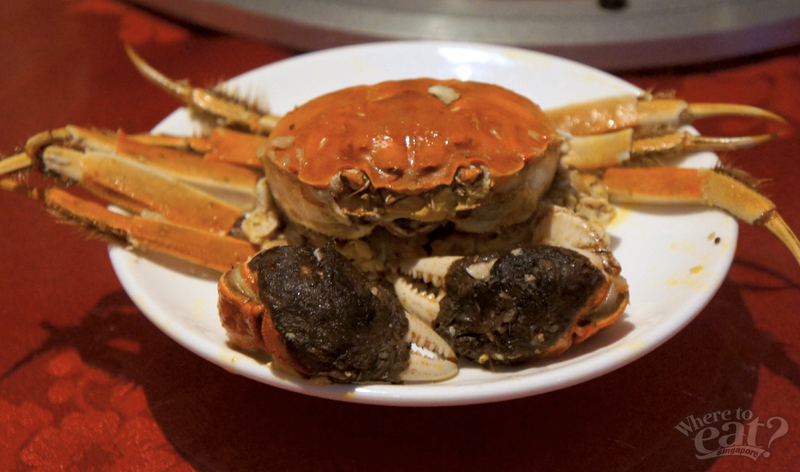 Here’s our story on our Hairy Crab tasting adventure! When this was served, squeals of “so cute!” echoed around the table. Indeed, this little guy here is very charming. 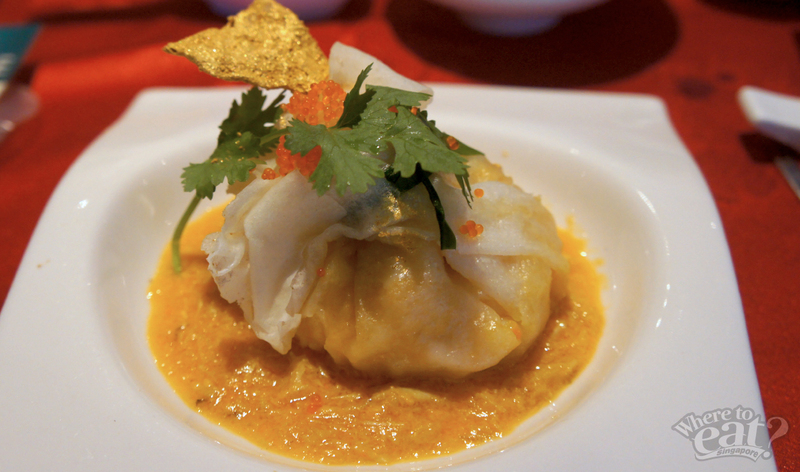 Mister Crab is a smooth crystal dumpling filled with succulent prawn and hairy crab meat. 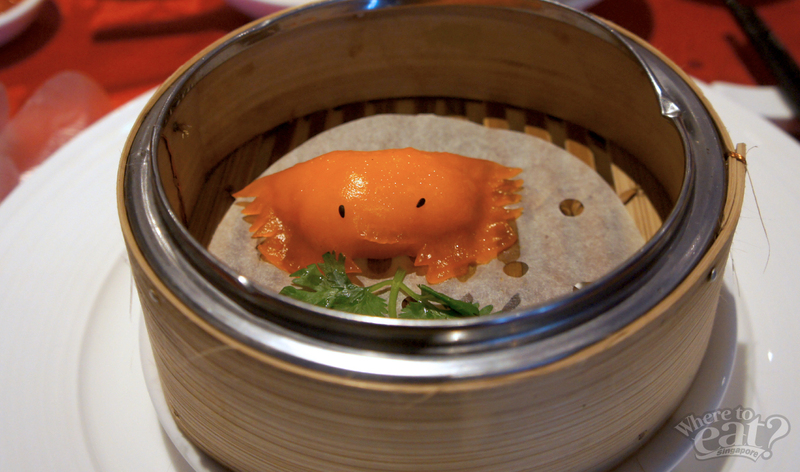 A take on the dim sum favourite ‘har gow’ (shrimp dumpling), Mister Crab is a good conversation starter to kick off the meal! Plus, he’s very photogenic too! The gravy was very flavourful and enjoyable, full of delicious golden crab roe. We couldn’t have enough of that! The hairy crab meat inside the dumpling was extremely generous and sweet. Definitely enjoyable for any crab fan who does not like to crack open crabs on their own. We wish the sauce was served hotter though- that would have made the dish perfect. Otherwise, it’s a resounding YES for us for this dish. The next dish we tried came in a Korean looking stone hot pot. We think that this keeps the crab hot and piping! The rice wine aroma wafted through the air as the dish arrived. We sampled the soup- it is surprisingly sweet with a slight tangy, spicy taste. There’s a whole hairy crab in the soup, which is kind of orangey with bits of grated ginger and pieces of crunchy wood ear black fungus, another traditional therapeutic herb. We were divided on this dish- people who are not fans of ginger may not totally dig this soup. Ginger is often paired with hairy crabs because hairy crabs are considered a ‘cooling’ food, and pairing it with ginger and wine (both ‘heaty’ food) would help balance your body. Some also added vinegar into the soup, as per Sze Chuan style. Now the main highlight of this dish is definitely the hairy crab. Smaller in stature than the crabs we are used to (ie. chilli crab sizes), the hairy crab has black ‘hair’ on its pincers. We were treated to a helpful step by step demo on how to de-shell this crusty sea creature. And this is what a perfectly de-shelled hairy crab looks like. Inspired by this specimen, we all plunged into deshelling our own crabs.Things however got very messy as we got busy cracking open the crabs to get to the coveted orange roe. Is eating crab never a neat affair? Nonetheless, the hassle was worth it as we slurped the golden, creamy roe from the crab chamber. Ahhh. Delicious. Next, you get to sink your teeth into juicy, fresh crab meat. 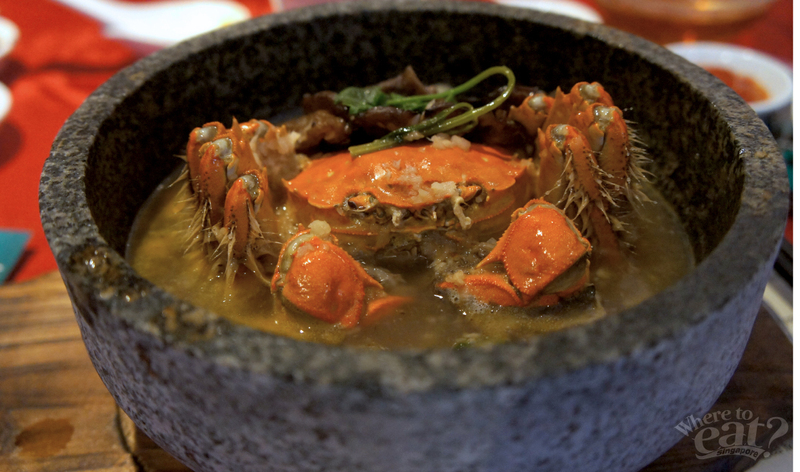 It tastes especially sweet because the crab has been cooked with the sweet and spicy rice wine broth. Next we were served little bowls of hairy crab lamian, topped with golden caviar. This dish did not disappoint. We learnt that the lamian was made and pulled in house, and it was very smooth and delicious. The orangey-red soup was thick enough to be reminiscent of Western crab bisque soups, and we also found little chunks of crab in the soup too. This soup is filling and robust, and the lobster-infused broth is topped with sesame seeds and garnished with coriander leaves that were a nice touch. A very pleasing dish. Lastly, we ended the tasting session with hot ginger soup and glutinous rice balls (sesame). Though I usually drink ginger soup as desserts, this soup was especially spicy. You thought it was over- but we were treated to the Peony Jade Mao Shan Wang Durian Mochi! Humble in appearance, the mochi balls were served cold. It was a very blissful experience. One bite and you could taste the rich durian pulp- it’s very smooth, cold and yummy, like ice cream! The mochi skin was so smooth that when you try to feel for it in your mouth, you can’t! It really melts in your mouth. What a great way to end the meal. 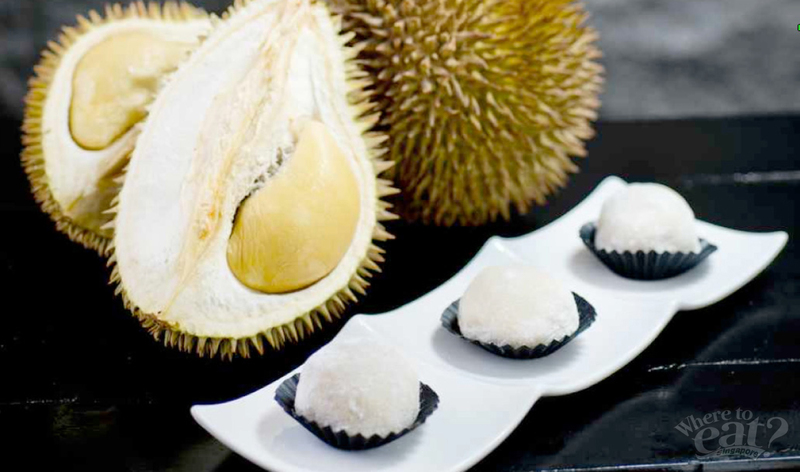 A must-try for durian fans- one bite and you will come back asking for more. A clear winner. Thank you Peony Jade for the invite, we had a fun hairy crab feast! 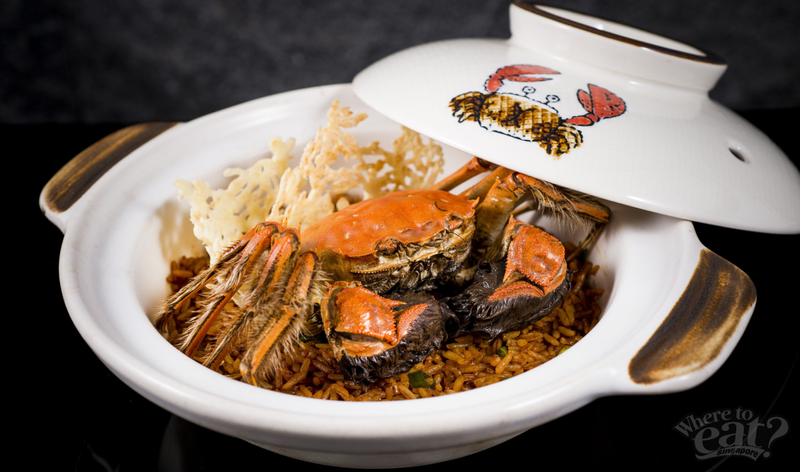 If you need to satisfy a crab craving, skip the usual chilli crab and try some seasonal hairy crab dishes instead. If you’re up for it, Peony Jade also serves hairy crab in a claypot version, a honshimeiji mushroom dish, or as a deep fried prawn ball creation. Otherwise, enjoy hairy crab Szechuan style with flavourful soups, lamian, or in a crystal dumpling. A scrumptious treat for all. menu and S$138++ per person for premium set menu. Outback Steakhouse – Live Adventurous, Go Outback.